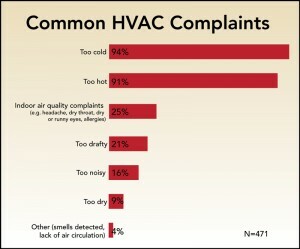 Building managers often comment that one of their mains goal is to reduce too hot/too cold complaints. 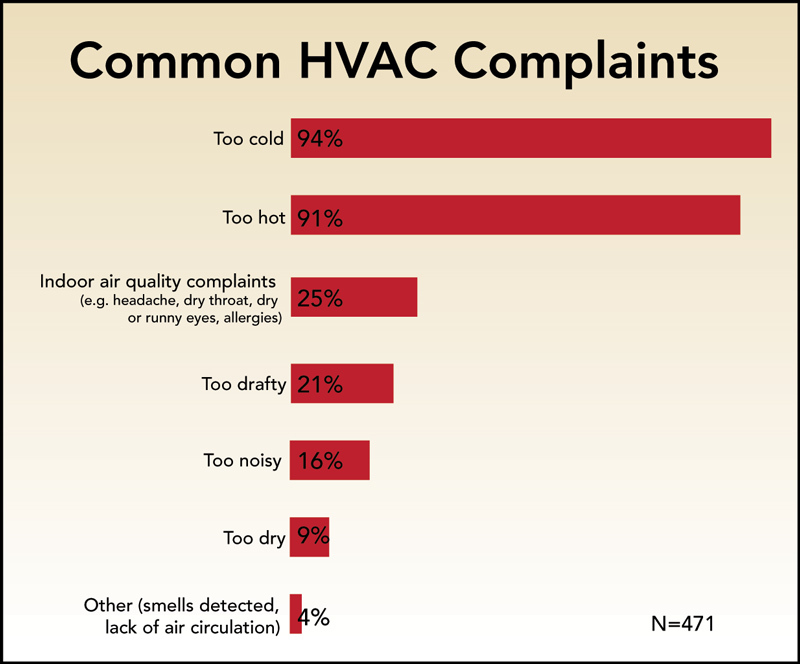 To improve comfort and reduce maintenance call outs, but also to increase energy efficiency, through less people using space heaters or fans to regulate temperature. Although the phrase ‘You can’t please all of the people all of the time’ quickly springs to mind, we’ve outlined several common variables and how eTRV+ can help to please most of the people most of the time! The Telegraph recently featured a study which has found that women, due to their lower metabolic rate are shivering in our workplaces. It states that many climate control systems in modern offices are based on the resting metabolic rate of a 40 year old man, which runs up to 30% faster than a woman’s – meaning men are comfortable when women may require a temperature increase of up to 4°C. Physiological factors such as weight and age also effect metabolic rate and the article calls for the study’s findings to be featured in the next revisions of the Thermal Comfort Standards. HSE provide information on measuring and assessing thermal comfort, here. eTRV+ features a manual boost button which provides a one hour heat boost on demand to suit individual comfort preference. ‘Resting metabolic rate’ is a key phrase above. 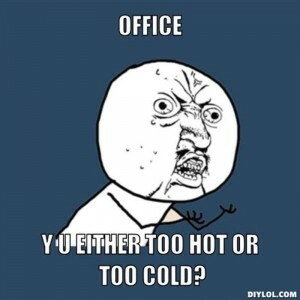 Variations in how the workplace is used make a huge difference to comfort levels. HSE recommends minimum temperature to be 13°C if there is rigorous physical effort or 16°C for sedentary work. There is no upper temperature limit, but if working temperatures are very high, appropriate controls should be in place. For more information, click here. eTRV+ provides room level zoning, allowing the building manager to set timers and temperatures to suit the activity within each room throughout the day. Internal environmental factors such as air circulation, drafts and the effect of solar gain all play a part in comfort throughout the day. South-facing rooms, initially benefiting from solar gain may overheat and North-facing rooms feel chillier. In a building with a central thermostat, this may lead to ‘HVAC Wars’ where the heating is trying to raise the temperature, unaware that some areas are overheating and triggering the cooling system. This not only wastes energy, but can impact severely on comfort (i.e. overheating, followed by blasts of cold air). eTRV+ provides temperature accuracy to 0.1°C, if a room gets above the programmed temperature, it quickly cuts the heating to prevent overheating. Outdoor temperature is a key influence over the level of heat a building needs. Even if the building is well insulated, heat loss will occur as outdoor temperature falls and vice versa. Many UK boiler systems are designed to provide heat to match the coldest days of the year, which means they overheat on the more common milder days, costing more money and wasting energy through opened windows and fans. If rooms overheat, eTRV+ closes the radiator valves, leading to greater pressure in the radiator system and warmer return water. The boiler will therefore use less energy to maintain water temperature. In addition, if you have variable speed pumps, speed will be reduced due to the retained pressure in the return system. In addition, if windows are opened due to the room feeling too warm, eTRV+ includes an Open Window Feature, which cuts the heating. Chalmor also provides weather compensation controls which control boilers according to outside temperatures. These are just a few of the many variables impacting on comfort, some technical ones being far easier to tackle than other human elements (e.g. appropriate dress for the season!). In a recent project, we have found that if building users can physically see the temperature there is a positive effect on the number of complaints. We provided information cards featuring thermometers to students in university accommodation blocks. As well as proving that the temperature was the set level they were expecting, the cards also explained how the students could temporarily boost their heating for an hour if required to suit individual comfort preference. Following this educational piece, the building manager reported a drop in the number of complaints. Do you have a too hot/too cold issue that eTRV+ could solve? Get in touch on 01582 748700 or marketing@chalmor.co.uk and we’ll provide a free analysis. Warming up to a happy workplace! Students – Switched to the max this winter? Reduced Rate VAT with eTRV!